Click the fractured e icon in the taskbar to bring up Edge. Click or tap on the ellipses in the upper-right corner to display the More pane, and then choose Extensions. 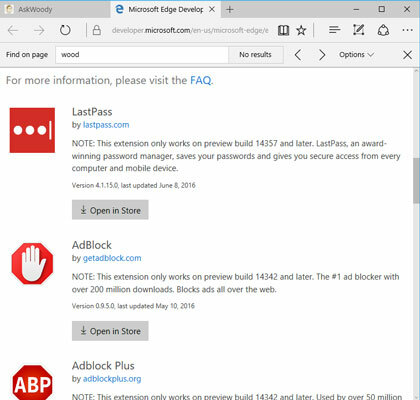 Edge offers a link to Get Extensions from the Store. Click it. You see a web page similar to the one shown. Click one of the Open in Store links. 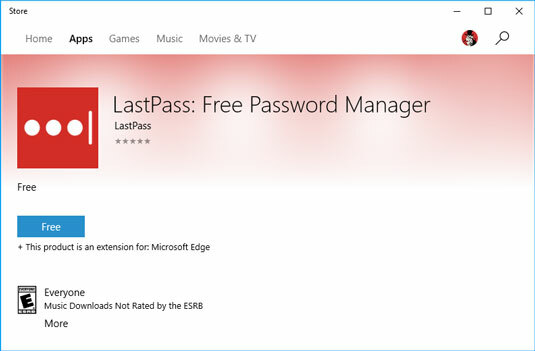 Here, the link for LastPass has been clicked. To download and install the extension, click or tap the Free box. After the extension is downloaded, click the Launch box. Launch is an overstatement. When you click Launch, the extension is loaded into Edge. 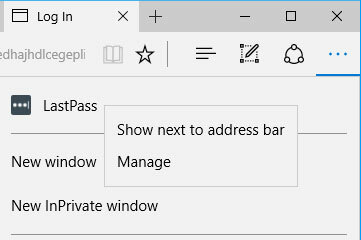 When you return to Edge, you see a You Have a New Extension pop-up like the one shown. Edge doesn’t automatically turn on extensions. Click Turn It On, and the extension goes live. 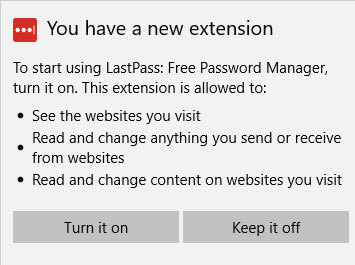 In the case of LastPass, the extension immediately brings up the LastPass sign-on screen, offering you a chance to log in or create a new account. As you can see, an icon for your new extension appears at the top of the More pane. To move the new extension icon up to the main address bar — to the left of the ellipses icon — right-click the icon and choose Show Next to Address Bar. That makes it considerably simpler to run the extension, without wading through a long list at the top of the More pane. Edge has not been upgraded independently of Windows itself. While other Universal Windows apps get updates at seemingly random times, Edge is in lockstep with each new version of Windows. Microsoft seems to be changing Windows to support Edge just as quickly as it’s changing Edge to support Windows. In a fast-paced browser world, where Chrome and Firefox get updates every few weeks, that schedule could be a death knell for Edge.